As the leaves are falling, I am feeling sad. I love the colorful trees, the fall vibes, the pumpkins and scarecrows outside on everyone’s porch. It is such a beautiful time of the year, I could get used to this! We have been busy this fall, lots and lots of fall activities, multiple visits to the farms, attending fall brunches and the list goes on! The festive season begins with fall. Last year we visited Farmer Ganyard at Upchurch Farm, but this year unfortunately we found out that it has closed down for good. We have a lot of farms around here. So, we decided to pick 2 farms, 1 close by and the other a bit of a drive. 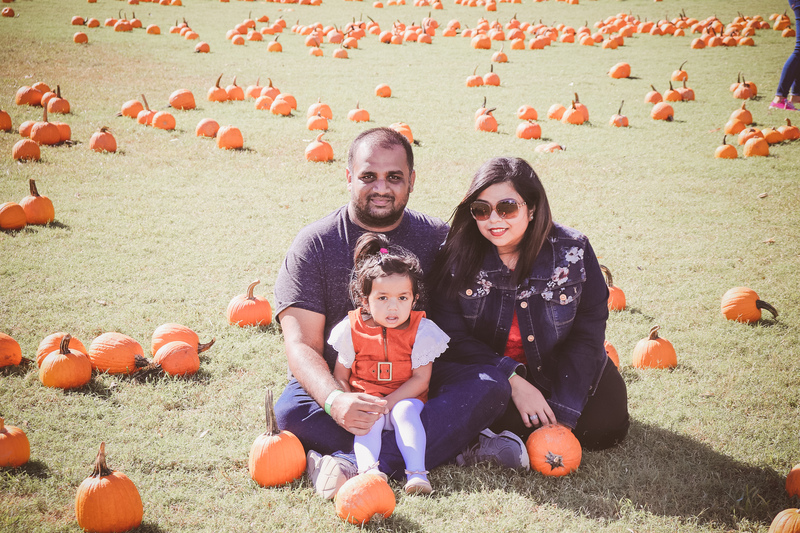 We first went to the Hill Ridge Farms in Youngsville, North Carolina. This farm is about an hour drive from our city Cary. It is a big farm with lots of activities and things to do for the little ones and the adults too. And hey guess what they have a big train ride too! Kid’s love train rides, don’t they? My daughter Ayrah (2 years old) loved playing in the corn bed, going on the train ride, playing in the hay and sitting between the pumpkins. All the above pics are taken at The Hill Ridge Farms in Youngsville, North Carolina. We also visited Phillips Farms Of Cary, NC later. It started to rain while we were at the Phillips Farms, so we were given a rain check ticket. Double fun right? While it was raining, Ayrah enjoyed playing in the corn bed which she couldn’t do for long at the Hill Ridge Farms due it being a little more crowded. There was a 10 minute (I’d really say 5 min) playtime allotted to everyone who went in the corn bed at the Hill Ridge Farms. Once done, they had to head back and join the queue for their turn to go play in the corn bed again. This was one of the reason we decided to visit Phillips Farm. Here are some pics from Phillips Farms are added below. We literally just went to Phillips Farms of Cary,NC so she could play in the corn bed. She had so much fun. The weather was amazing. We loved our visits and they both were fun in their own unique way. I know the farms are now closed for pumpkin patch & pumpkin season, but these two were worth visiting. We will be going to the Hill Ridge Farms for Festival Of Lights soon. And when i do, i will update my experience with pictures. Till then, have fun, be good!